Michael Phelps is the most decorated Olympian of all time, swimmer or otherwise. No athlete has won more gold medals than his 23. His performance at the 2008 Beijing Olympics, where he won eight gold medals, might never be replicated. One of his races at those Games shows why he is one of the best athletes ever – by always being prepared. In the finals of the 200-meter butterfly, the goggles Phelps was wearing started to fill with water. By the beginning of his third lap (of four), Michael couldn’t seeing anything – the wall, the other swimmers, the black line at the bottom of the pool. Yet, he remained focused and won the race. How did he do it? Michael Phelps had prepared for this very scenario. In fact, it occurred to him in a race earlier in his career. Plus, he and his coach, Bob Bowman, practiced for adverse situations like this one. In fact, Bowman was known to step on Phelps’ goggles and break them so he had to train without them. 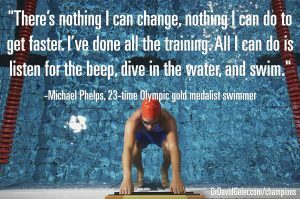 Phelps knew from extensive practice that he needed a certain number of strokes to reach the wall on every lap – 16 on the first length, 18 on the second, 19 on the third, and 20 or 21 on the final length of the pool. When his goggles started filling with water, he didn’t panic. Instead, he started counting his strokes. On the third leg, without being able to see the wall, he touched the wall with his hand perfectly after stroke 19, without hitting his shoulder or head. And even though he wasn’t sure where he was in relation to the other racers, Phelps knew that he should make contact with the final wall at stroke 21. And he did, winning the race and setting a world record. Do you prepare for every possibility? Michael Phelps overcame a situation that certainly would have held many swimmers back because he had prepared for it. Do you prepare for every possibility in this way? Do you think out all the possible scenarios – even the bad ones – and practice in case one of them happens? This lesson can apply outside of sports too. In the video above, I offer examples of situations in your work, at school or in sports where you could learn to prepare for possible adverse conditions. If you prepare for the worst, you will be ready no matter what happens. Then you could become a Champion in Sports, Business and Life. Episode 382: How can you best stop food cravings?